I went to see the second performance of Heartspur on 2 October 2018 at the Dovecote Centre, not knowing what to expect. Being in a wheelchair, I was given a front row seat and therefore an excellent view of the stage. 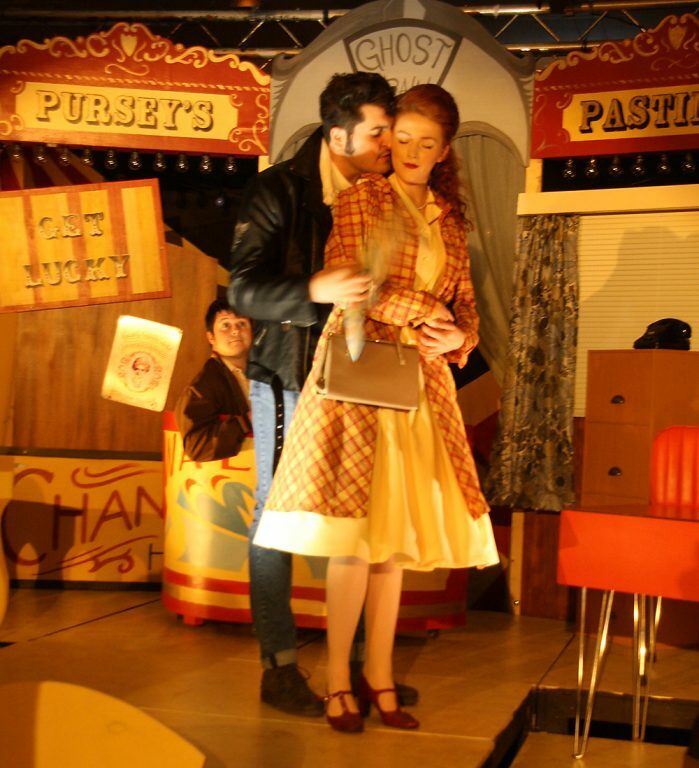 The background depicted the Pursey’s Funfair, and the stage was set out like an office. The story revolved around the fairground family of the Purseys being threatened by another family, the Kings of London. It was based loosely on Henry IV Part One, and the Shakespearean-influenced language was beautiful. All credit to writer, Bob Shannon. As if this wasn’t enough, there were huge bursts of 60s music, including Duke of Earl. David McCarthy as Hotz was magnificent with his Elvis-type quiff, and Bethan Amber as his long-suffering wife Kate, was also superb. The whole play, directed by Gilllian Hambleton, was a tour-de-force from the Northumberland Theatre Company. I found it intellectually stimulating, exhilarating and good fun, a winning combination and another triumph for the Dovecote Centre. If you’ve not been there yet, go to anything they put on. I’ve not been disappointed yet.